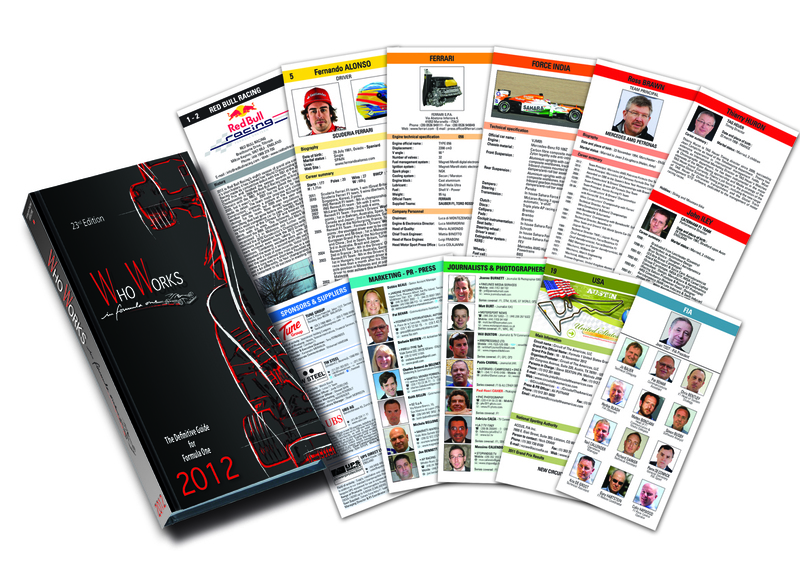 The definitive guide for Formula One used by professionals worldwide. Names, addresses, telephone numbers, e-mail addresses to contact everyone in Formula One. Who Works in Formula One is now in it’s 23rd year of publication and has become THE guide for Formula One. It lists in an easy to read format in-depth information on everyone and everything in Formula One and is recognised the world over as the essential source of information for Formula One professionals. Published with a glossy hard cover in a convenient size for reference it has detailed information on the 2012 Formula One World Championship: teams, drivers, cars, engines, team principals, mechanics, engineers, key people, sponsors, suppliers, marketing, PR and press officers, photographers, journalists, tracks, F1 officials and much more hard to find information.